Scratching and digging may be unacceptable in human circles, but wombats don’t live by the same creed. 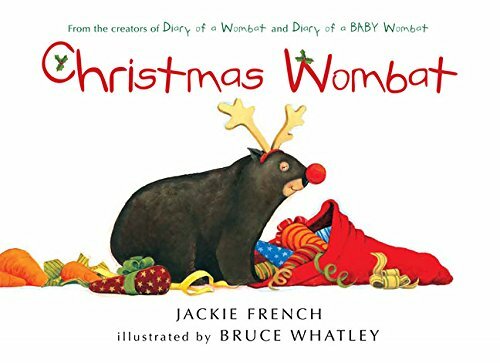 That’s why the delightful little wombat in author Jackie French’s latest picture book, Christmas Wombat, feels no shame as she scratches, digs, eats, and sleeps to her heart’s content. In the book, the wombat lives a mundane life until a certain festive season rolls around. Suddenly, red and yellow “dangly things” (Christmas ornaments) bump her nose as she tries to enjoy a nice grassy snack. Then she is forced to show several antlered creatures hooked to a sleigh who is boss when she catches them munching on a dish of carrots she’s sure belong to her. Of course, the dish is sitting right next to a sign that reads, “For Santa and the Reindeer,” but the wombat cannot read, so she misses this little tidbit. After she defeats the reindeer, the little wombat is so sleepy, she snuggles up in the curved front bumper of the pretty sleigh and ends up taking a ride with Santa himself. Thus begins a wonderful journey in which the wombat learns that the earth is a big, big place, carrots can be found almost anywhere, and reindeer aren’t so bad after all. This is a Christmas book with a twist to delight audiences young and old. Ms. French writes in short, clear sentences that are perfect for younger children, but with extra help from artist Bruce Whatley’s hilarious illustrations, the universal humor in this story still manages to shine through. One quibble is that those who have not read the prequel to this book (Diary of a Baby Wombat) may be slightly challenged understanding the wombat, its uneventful life, and its obsession with carrots. That aside, this book should do well in elementary school libraries as supplemental reading, in the science classroom as a nature book for wildlife lovers, and in the home as a welcome addition to any child’s personal library.